Health, beauty, and style—it doesn’t have to be one or the other. Not anymore. It can feel hard (over-freakin-whelming) making the “right” choices that still feel good, and beautiful. I’ve soo been there. But, you’re in luck. At Saint Virginia, we make healing textiles to give you a better choice, an easier choice, a more beautiful choice. If you or someone you love is in need of healing, and most of us are (toxins, anyone? ), you're in the right place. If you have sensitive skin, allergies, or you just care about your overall health—welcome to the club. If you think organic shouldn’t have to mean boring, and choosing a healthier lifestyle and avoiding toxins and harmful chemicals shouldn’t be so hard, I agree! More beauty in your life? Check. Easy, natural style? Amen, sister. Better business, ethical sourcing, transparency, exceptional customer service? Yes, yes, yes, and yes! Are you with me? Get on the list and get 10% off your first order, plus more good stuff to come. Here’s to your health! Healing. It’s closer than you think. I'm Amy, the designer and maker behind Saint Virginia, and I create beautiful, organic, healing textiles for you and your home. Whether you need help creating a healthier, more beautiful home where you can celebrate life with friends and family (the best medicine of all), finding the perfect gift, or buying something soft and pretty for yourself to remind you that healing is always possible—and closer than you think—Saint Virginia is for you, my dear. Saint Virginia started with a cancer story. When I was diagnosed with stage III breast cancer 8 years ago, my baby girl was ten months old. Tragic. But then a gift transpired, as sometimes happens with tragedies. In my relentless pursuit of healing, I began to look more closely at the world around me, and it seemed everything could potentially be dangerous: food, makeup, hair color (no! ), household cleaners, water, clothing, textiles. It was overwhelming. But then I began to see healing everywhere, too. In nature, in God's abundance. It all led me to a more natural, organic lifestyle, the way we are meant to live. I knew that healing would begin with me (darnit! ), God, and making something beautiful out of this mess. The gifts we never asked for can be the best gifts of all. I did a little research. Um, just a little. Toxins are real, and there is tons of research to prove it. I studied all of it when I went to work for the world’s preeminent cancer organization, the American Society of Clinical Oncology, and then other cancer-related organizations after, like the Association of Community Cancer Centers. I will tell you this one thing I’ve learned above everything else: our bodies are unique and beautiful, and healing doesn’t come from doctors. Doctors are angels, don’t get me wrong—medicines can cure (but not actually heal). You are the most crucial part of the equation. It all starts with you and the choices you make, and it’s never too late. The chemicals though. They’re bad, seriously. Time’s up. Gotta start choosing better, love. You can take steps now to help your body heal—body, mind, and spirit. Choosing an organic lifestyle means a life made up of small choices that head toward healing: choosing to buy organic strawberries instead of conventional pesticide-laden strawberries for you and your family; choosing to get your hands dirty weeding your garden or using healthier soil practices, like planting flowers for the bees and other natural and sustainable options instead of using Roundup; choosing organic fibers and colors for your clothing, accessories, and table linens, instead of irritating, polluting, and even carcinogenic synthetic fabrics and dyes. Choosing beauty over affordability; quality over quantity; integrity over convenience. It all adds up, for good and for bad, either way you go. Saint Virginia is here to help you make a better choice. 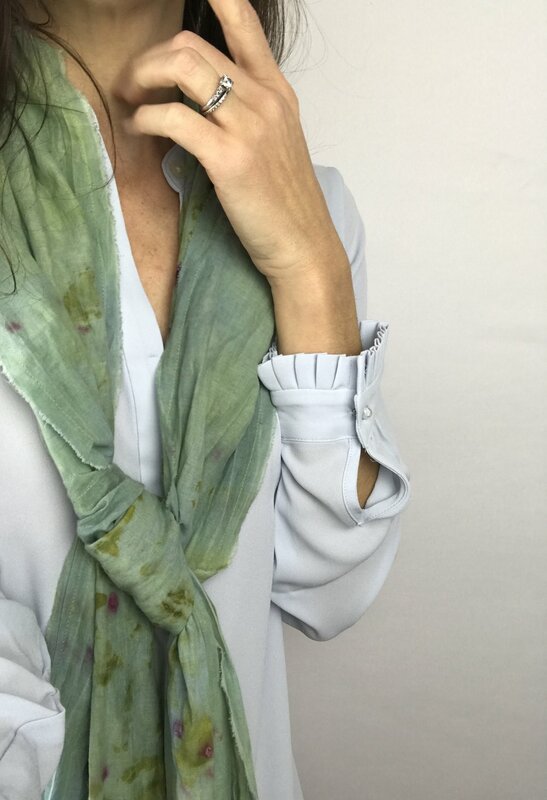 Every scarf, every tablecloth—everything—is made from organic cotton and hand-dyed with natural, life-giving color, helping to support farmers who are doing the right thing by growing healthier crops and using farming practices to improve the health of the soil, water, and air in our neighborhoods, communities, and planet, instead of harming it—which in the end improves the health of every life, your life—your one and only precious life. Check out the shop, and here’s to your health, my friend.